Día de los muertos is a holiday celebrated in Mexico. It is a time to joyfully remember friends and family members who have died and celebrate their memory. Stop by the entrance to Learner’s Hall this week to see the beautiful and vibrant ofrenda set up by several of our Spanish track teachers. View artwork and writing created by TIS students. 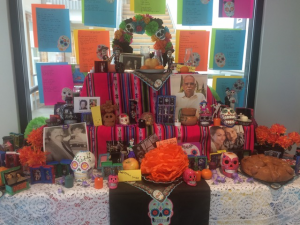 Contribute to the exhibit by adding a name or copy of a photo of one of your ancestors or family members who has died to our ofrenda. For a authentic treat, visit the exhibit on Thursday, November 1 from 3 to 4:30pm to sample pan de muerto and hot chocolate.